1.5.1941 - 9.4.2019 Passed away peacefully at home with family by her side. Loved Wife, Mother and Grandmother, now at peace. In memory of her we ask you to please wear bright, beautiful colours to mark the happy soul she was. Love from John, Amanda, John and Tammy. 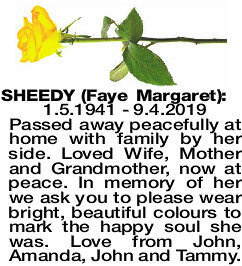 The Funeral Service for the late Faye Margaret Sheedy of Beckenham will be conducted in the Chapel of Peaceful Funeral Services, 1787 Albany Hwy, Kenwick on Monday (15.4.2019) commencing at 12 noon. 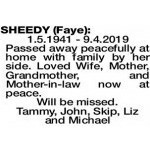 SHEEDY FAYE 1.5.1941 - 9.4.2019 Passed away peacefully at home with family by her side. 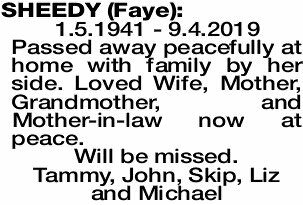 Loved Wife, Mother, Grandmother, and Mother-in-law now at peace. To our beautiful Mum/ Nanna, rise above, our sweet Angel. You are now at peace. Reunited with your Mum and Dad. No longer here on earth but forever in our hearts. Love Amanda, Sean, Lisa and David.